Reflection occurs when light rays encounter a surface that they cannot completely travel through. Certain materials reflect light more efficiently than others due to their molecular make-up. When a material's atoms allow their electrons to move around loosely it will not absorb much light energy and therefore reflect it back out. If a material has electrons that are mostly held in place then it will absorb most of the energy from the light and not much will be released back out. The Law of Reflectance states that the angle of incidence always equals the angle of reflection. This means that light will always reflect back at the same angle that it hit. Reflection is categorized into two types;Specular and Diffuse. Specular reflection is when light strikes an even, smooth surface. This causes the light to be reflected back in the same definite angle. In diffuse reflection light encounters an uneven surface where the rays meet many different angles and the light is reflected back in many directions. The mirrors in the exhibit are turned at a 45 degree angle to the laser beam so that they will reflect the beam perpendicular to the original. Specular reflection is what causes clear mirror images and diffuse reflection will cause mottled or no recognizable images. The mirrors in this exhibit utilize specular reflection to turn the beam and keep it intact so that it reaches the next mirror. Beam degradation also affects image clarity in both Specular and Diffuse reflection. 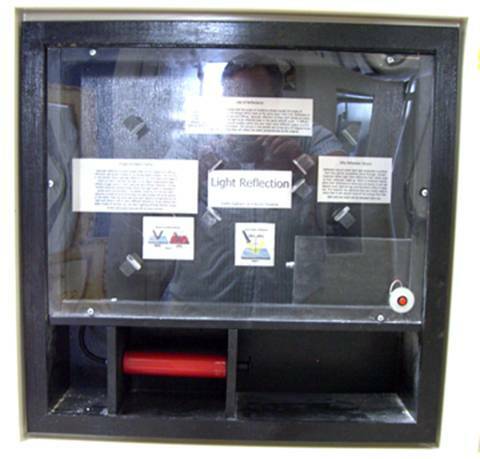 In this exhibit there are several areas where the light beam is reduced in power and concentration. The plastic covering the mirrors both absorbs a small amount of energy and also breaks off small pieces of the beam. Also the dust particles each absorb a small amount of light and throw it off in many different directions. If you follow the beam inside of the box you can see it getting dimmer and its moves further along and bounces off of more mirrors.